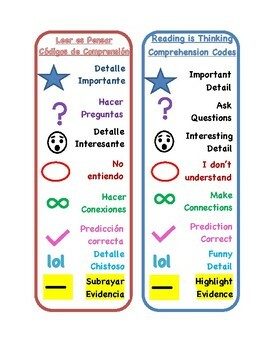 These bookmarks are great to teach students to use universal codes when reading in order to show their thinking when annotating. It is imperative for students to read and interact with text in order to comprehend and gain meaning of the text. These bookmarks are also great to use and teach during testing so that students read and think and not just use isolated testing strategies. The bookmarks are available in Spanish and English.